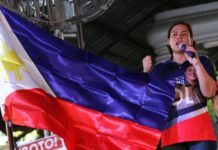 CAGAYAN DE ORO CITY (MindaNews/ 13 Oct) – Involuntary hunger in the past three months was most pronounced in Mindanao, the island grouping where President Rodrigo Duterte, the country’s 16th President and first Mindanawon to lead the nation, continued to get the highest net satisfaction rating in september. 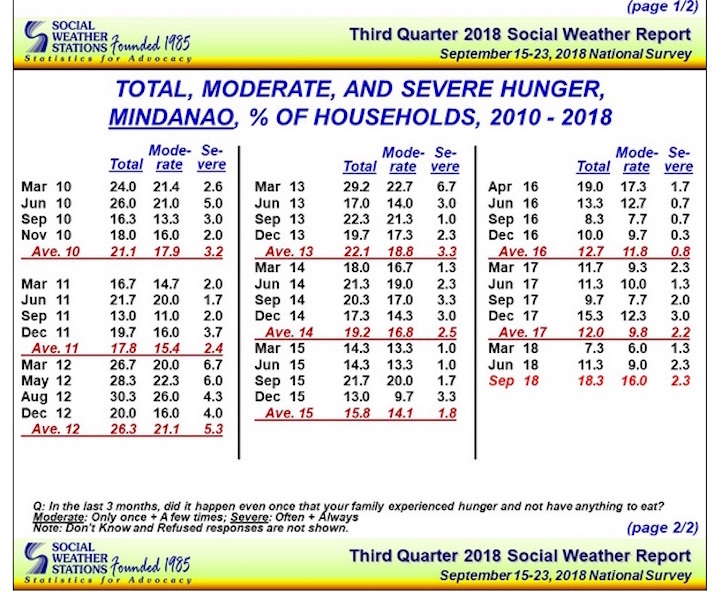 Involuntary hunger in Mindanao increased by 7 points, from 9% in June to 16% in September, a Social Weather Stations (SWS) survey released on Friday showed. The hunger rate for the same period went up by 5.4 points in Balance Luzon, 4.3% in Metro Manila but decreased by 3.3% in the Visayas. The survey, conducted from September 15-23, found that 13.3% or an estimated 3.1 million families experienced involuntary hunger at least once in the past three months. 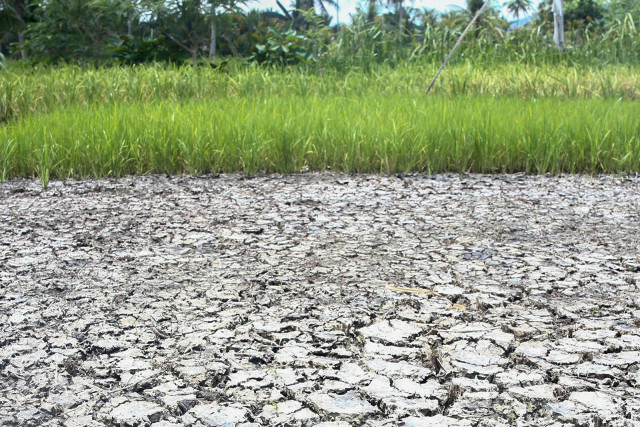 “Moderate Hunger refers to those who experienced hunger ‘Only Once’ or ‘A Few Times’ in the last three months, while Severe Hunger refers to those who experienced it ‘Often’ or ‘Always’ in the last three months,” the SWS explained. “The measure of Hunger refers to involuntary suffering because the respondents answer a survey question that specifies hunger due to lack of food to eat,” it said. “This is 3.9 points above the 9.4% (est. 2.2 million families) quarterly Hunger in June 2018. This is the highest since the 15.9% in December 2017in the past three months,” it said. “The quarterly Hunger rate of 13.3% consisted of Hunger in Metro Manila at 17.3% (est. 549,000 families), Balance Luzon at 12.7% (est. 1.3 million families), the Visayas at 6.0% (est. 269,000 families), and Mindanao at 18.3% (est. 975,000 families),” it added. 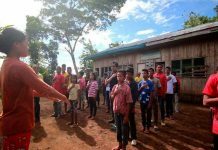 The survey found that hunger in Mindanao rose from 11.3 percent or 604,000 families in June to 18.3 percent or 975,000 families in September. Mindanao continued to express satisfaction over Duterte’s performance as President, giving him +77 or “excellent” in September. Since he assumed the Presidency, Mindanao has consistently given Duterte the highest net satisfaction rating in surveys nationwide. 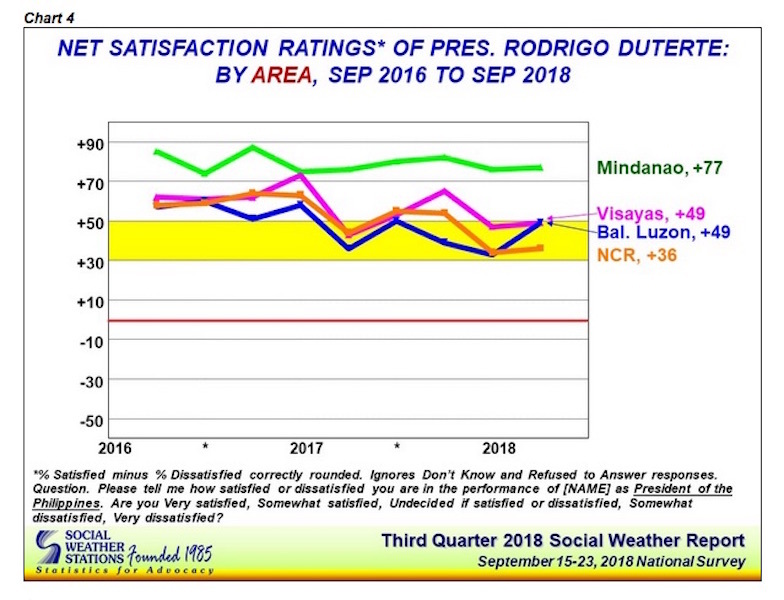 The SWS’ Third Quarter 2018 survey on net satisfaction ratings of the President, conducted also on September 15 to 23, found 70% of adult Filipinos satisfied, 14% undecided, and 16% dissatisfied with Duterte’s performance as President, bringing the net satisfaction rating to +54 (% satisfiedminus % dissatisfied),classified by SWS as “verygood.” In June, Duterte got a personal record-low of +45 (good). Duterte’s net satisfaction rating stayed goodin Balance Luzon, at +49 in September, up by 16 points from +33 in June: goodin the Visayas, at +49 in September, from +47 in June; goodin Metro Manila, at +36 in September, from +34 in June; and excellentin Mindanao, at +77 (in September, from +76 in June. Hunger in Metro Manila rose from 13 percent (412,000 families) to 17.3 percent (549,000 families), and from 7.3 percent (758,000 families) to 12.7 percent (1.3 million families) in Balance Luzon.